Every once in a while something comes along that is just too good not to share. Now, I realize that because we’re not Melrose shoppers, we may be a bit late to this trend, but we’d like to discuss tattoo sleeves. Not full-sleeve tattoos. 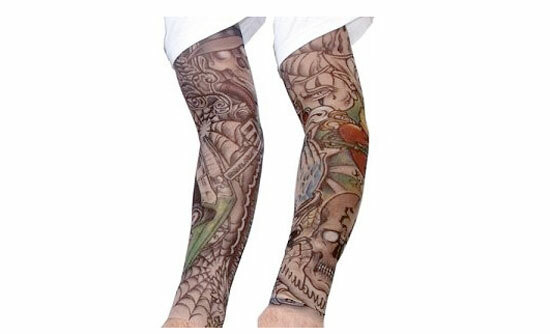 Tattoo sleeves made of mesh. If you clicked on the link, you’ll see some brand them as “Realistic Gangsta Tattoo Sleeves”. WTF? (And, we started a whole new category just for postings like this.) The item description says they can be used on either arms OR legs. Double-WTF.